Students sit on the floor in a circle, some have their eyes closed, some are swaying and bouncing, some are tapping a beat on their knees. Their teacher, an educator/singersongwriter plays the guitar and leads them in singing a mash-up of Eyes on the Prize (www.youtube.com/ watch?v=0ZWdDI_fkns) and Mi khamokha. The students sing along with apparent intense kavvanah. These vignettes illustrate key components of Beit Rabban’s tefillah program, which blends an emphasis on fluency in the recitation of tefillot and knowledge of their meaning with spiritual and religious growth. In this article I describe Beit Rabban’s tefillah program – its goals and how the structure and components of the program help achieve these goals. I also include some reflections on lessons learned that I hope will be useful to others in the field. For the purposes of this piece, I focus on elementary school (K-5); however, much of what I describe is true of our early childhood program as well. Two years ago I engaged in a process to develop goals for Beit Rabban’s tefillah program. I collected feedback from teachers and the professional leadership of Beit Rabban and consulted with a focus group of parents and seasoned educators. I also participated in the first Aleinu LeShabe’ach Tefillah Symposium, convened by the Pardes Institute of Jewish Studies, in which I worked with other experienced tefillah educators to share goals and techniques for teaching tefillah. Goal one is based on the work of Rabbi James Jacobson-Maisels who argues for an approach to tefillah education which focuses on “prayer as a technique to cultivate certain emotions, dispositions and ways of being in the world” (Jacobson-Maisels, 2013). While Rabbi Jacobson-Maisels lists eleven constellations of these dispositions, at Beit Rabban we have chosen the four that we think are most elemental and relevant to elementary students on which to focus – awe, yearning, gratitude and compassion. These four correspond to the traditional categories of shevah, bakashah and hoda’ah, and include a fourth component of relationship and community. We understand one primary purpose of tefillah education as supporting students in cultivating these dispositions Tefillah education at Beit Rabban gives students opportunities to strengthen and deepen their appreciation for the world; their hopes and desires for themselves, others and the world; their feelings of thankfulness; and their inclination to feel empathy and practice compassion to others. Goal two is informed by the Standards for Fluency in Jewish Text and Practice, a joint project of Beit Rabban and Mechon Hadar, which articulates a vision for fluency in tefillah, as well as other areas of Jewish text and practice. While also including dispositions that should be cultivated, these fluency standards and the tefillah program at Beit Rabban emphasize the importance of building students’ practical tefillah skills and knowledge, setting them on a path to eventually feel confident and comfortable to participate in adult communal prayer. Specifically, this means that fifth graders are fluent in birkhot hashahar, selections of pesukei dezimra, all of the weekday morning birkhot keriat shema, the weekday Amidah, Hallel and birkat hamazon. This goal includes educating students to recite these tefillot accurately and fluently, navigate the siddur, perform the choreography of the service and understand the meaning of the words they are saying. Goal three emerged from the non-denominational aspect of Beit Rabban’s identity. It celebrates the fact that different Jewish communities – and even different Jewish individuals – approach tefillah from a range of perspectives and that tefillah looks and feels different in different places. Students learn to respect this diversity and to value the richness that emerges from a multiplicity of approaches. So how do these goals play out in practice at Beit Rabban? In the words of Abraham Joshua Heschel, “Reading or studying the text of a prayer is not the same as praying” (Heschel, 1998). Because Beit Rabban’s tefillah program has the distinct goals of both “praying” and “reading or studying the text of the prayer,” we divide tefillah education into two parts – tefillah and iyun tefillah. Tefillah is the practice of communal prayer (praying), while iyun tefillah is a class about tefillah (reading or studying the text of the prayer). Separating these two aspects of tefillah education ensures that neither is sacrificed to the other in terms of class time and that each experience can be created to serve its own goals. At Beit Rabban, tefillah takes place in each classroom every morning for 15 to 20 minutes, depending on the age of the students. The fact that tefillah is a daily part of the schedule communicates to students the value of tefillah as a religious practice and obligation to which we commit ourselves. This daily recitation of tefillot, more than anything else, is essential for building fluency in the pronunciation and chanting of the tefillot. 3 days of routine tefillah: During these days, students recite the tefillot that they have learned through that grade. In older grades, because they cannot recite all of these tefillot in 20 minutes, they balance between praying aloud and quietly. They also may decide to say a few core tefillot every day (Shema and Amidah) and select different additional tefillot on each of the three days such that over the course of the week, they say all of the tefillot that they have learned. 1 day of musical tefillah: On this day, students are joined by a musical tefillah educator who leads them in tefillah with guitar. Usually they focus on a particular tefillah or two, learn a new melody, and reflect on the meaning of that tefillah. They experience the power of music to affect their mood, build community and bring new meaning to tefillot that they say every day. They can then incorporate these new melodies into the three days of routine tefillah, thus bringing more variety and opportunity to experience tefillot in different ways into those days as well. 1 day of creative tefillah: On this day, teachers and students can experiment with different ways of praying. Sometimes classes go outside and connect tefillah to an appreciation of the natural world. Sometimes students watch inspiring YouTube videos and reflect on the connection of these videos to tefillah. Sometimes students bring pieces of music (without words), the class davens silently while the music plays in the background and then students reflect on how the music affected their experience of tefillah. Sometimes classes do mindfulness and breathing exercises. These different experiences help students connect to tefillah and deepen their spirituality in different ways. They are also opportunities to explicitly work on the different dispositions that tefillah is meant to cultivate. At Beit Rabban, iyun tefillah takes place once/week for 40 minutes. New tefillot are introduced during iyun tefillah and students learn the meaning of the tefillah and draw personal connections to it Iyun tefillah is also when students learn the structure of the prayer service and siddur navigation (which is reinforced during daily tefillah). Most of the time, iyun tefillah is devoted to building students’ content knowledge of tefillot, and new tefillot are introduced almost every week. However, iyun tefillah also provides an opportunity for reflection on bigger picture questions about tefillah, like the balance of keva and kavvanah, what do we believe about God, and are our prayers answered. It also serves as an opportunity for students to troubleshoot challenges in the daily tefillah – like lack of energy or conflict between the leader and the kahal (class)–and reflect on their tefillah experiences and set goals for themselves. Not only does the structure of the tefillah program at Beit Rabban support our goals, our selection of siddur does so as well. Until the middle of first grade, students create a large communal siddur. Whenever they learn a new tefillah, they create an artistic reflection on that tefillah which accompanies the text of the tefillah in their large siddur. The large print of the text supports their developing literacy skills while the art reminds them of the themes of the tefillah and their communal experience of creating that art. In first grade, our students make the transition from this class siddur to individual siddurim. Students receive the Koren Talpiyot Siddur, an adult, Hebrew siddur with English instructions but no translation. We have chosen not to give our students a “children’s siddur” in order to build their siddur navigation skills early on. Having an adult siddur also makes students aware that there is much more to tefillah that what they have learned and motivates them to learn more. While we have a single siddur that all students use, we also acknowledge that not all Jews daven from the same siddur (goal three). After students receive their siddurim in first grade, one iyun tefillah class exposes students to a “siddur gallery” in which they can explore many other siddurim and notice similarities and differences. In addition, when they learn the “personal status” berakhot in birkhot hashahar, they learn the version printed in their siddurim as well as several other versions. They then discuss with their parents which version they will say. When the class says birkhot hashahar aloud, they pause for these berakhot and students quietly say the version they have chosen. In this way, we encourage students to have ownership over the tefillot that they say and to respectfully appreciate and learn from the different choices that their classmates make. Separating tefillah and iyun tefillah has indeed allowed us to strengthen each of those experiences. In particular, the weekly iyun tefillah class ensures that tefillot are taught in a systematic way. Providing teachers with a set list of tefillot to be taught in each class has enabled students to learn more tefillot each year and to build their knowledge of tefillot from one year to the next. Musical tefillah is a highlight for students and has both deepened their experience of tefillah and broadened their repertoire of melodies for tefillot. Knowing how to facilitate an effective creative tefillah experience can be challenging for teachers and would be more successful if teachers had more models of what it could look like. 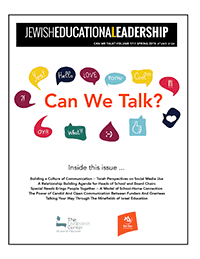 While we seek opportunities in tefillah and iyun tefillah to cultivate awe, yearning, gratitude and compassion, measuring whether students are, in fact, strengthening these dispositions is very difficult (much more difficult than measuring whether students can recite tefillot fluently or know what they mean). However, there are many opportunities to integrate tefillah with the social-emotional learning curriculum and we will be developing more resources to help teachers do so. At Beit Rabban, we are continuing to build on these learnings and strengthen our tefillah program. We are also eager to be in dialogue with other schools that are experimenting with their tefillah programs and to share our experiences and resources. We look forward to empowering students with the skills, knowledge and dispositions to create meaningful prayer experiences for themselves and their peers. References Heschel, A. J. (1998). Man’s Quest for God. Santa Fe, NM: Aurora Press. Jacobson-Maisels, J. (2013). 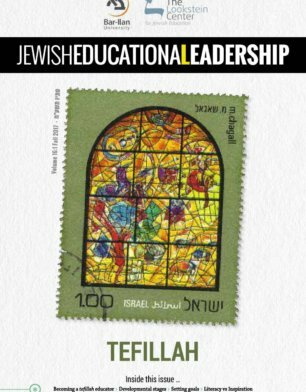 Prayer as transformation: A vision of tefillah education. HaYidion, Spring 2013.